Celebrate all things German with a night of authentic German foods, beer & wines, plus live music, entertainment and dancing. 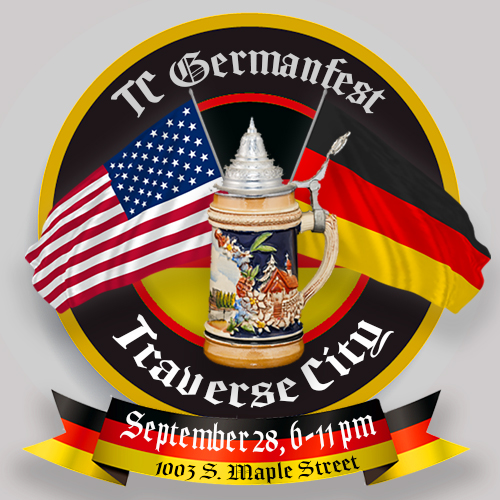 Featuring live music & entertainment, dancing, and Authentic German foods, TC Germanfest is a fun & memorable event celebrating all things German! Dance to live music by Bavarian Inn's Linda Lee and the Golden-Aires, and be entertained by Da Frankenmuda Fratz'n. Enjoy delicious appetizers as you join the fun under the big-top at the corner of 13th & Maple in Traverse City! The Beer Garden will be open, where you can purchase genuine imported German Beer & wines from the Hofbräuhaus in Munich Germany. General Admission tickets are only $20, to enjoy appetizers, live music, entertainment & dancing. The Beer and Wine is sold separately for $7 each drink ticket. Get your Bavarian on and wear your Lederhosen or Dirndl; or just put on a fedora or a crown of flowers to feel more festive! Not into the costume thing? No problem. Just come & enjoy a memorable evening of great food, beverages, music & dancing! Beer & wines sold separately. This is a 21 & older event.